A leaf spring takes the form of a slender arc-shaped length of spring steel of rectangular cross-section. In the most common configuration, the center of the arc provides location for the axle, while loops formed at either end provide for attaching to the vehicle chassis. For very heavy vehicles, a leaf spring can be made from several leaves stacked on top of each other in several layers, often with progressively shorter leaves. Leaf springs can serve locating and to some extent damping as well as springing functions. While the interleaf friction provides a damping action, it is not well controlled and results in stiction in the motion of the suspension. For this reason, some manufacturers have used mono-leaf springs. A leaf spring can either be attached directly to the frame at both ends or attached directly at one end, usually the front, with the other end attached through a shackle, a short swinging arm. The shackle takes up the tendency of the leaf spring to elongate when compressed and thus makes for softer springiness. Some springs terminated in a concave end, called a spoon end (seldom used now), to carry a swiveling member. The leaf spring has seen a modern development in cars. The new Volvo XC90 (from 2016 year model and forward) has a transverse leaf spring in high tech composite materials, a solution that is similar to the latest Chevrolet Corvette. This means a straight leaf spring, that is tightly secured to the chassis, and the ends of the spring bolted to the wheel suspension, to allow the spring to work independently on each wheel. This means the suspension is smaller, flatter and lighter than a traditional setup. There were a variety of leaf springs, usually employing the word “elliptical”. “Elliptical” or “full elliptical” leaf springs referred to two circular arcs linked at their tips. This was joined to the frame at the top center of the upper arc, the bottom center was joined to the “live” suspension components, such as a solid front axle. 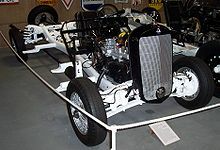 Additional suspension components, such as trailing arms, would usually be needed for this design, but not for “semi-elliptical” leaf springs as used in the Hotchkiss drive. That employed the lower arc, hence its name. “Quarter-elliptic” springs often had the thickest part of the stack of leaves stuck into the rear end of the side pieces of a short ladder frame, with the free end attached to the differential, as in the Austin Seven of the 1920s. As an example of non-elliptic leaf springs, the Ford Model T had multiple leaf springs over its differential that were curved in the shape of a yoke. As a substitute for dampers (shock absorbers), some manufacturers laid non-metallic sheets in between the metal leaves, such as wood. Leaf springs were very common on automobiles, right up to the 1970s in Europe and Japan and late 1970s in America when the move to front-wheel drive, and more sophisticated suspension designs saw automobile manufacturers use coil springs instead. Today leaf springs are still used in heavy commercial vehicles such as vans and trucks, SUVs, and railway carriages. For heavy vehicles, they have the advantage of spreading the load more widely over the vehicle’s chassis, whereas coil springs transfer it to a single point. Unlike coil springs, leaf springs also locate the rear axle, eliminating the need for trailing arms and a Panhard rod, thereby saving cost and weight in a simple live axle rear suspension. A further advantage of a leaf spring over a helical spring is that the end of the leaf spring may be guided along a definite path. A more modern implementation is the parabolic leaf spring. This design is characterized by fewer leaves whose thickness varies from centre to ends following a parabolic curve. In this design, inter-leaf friction is unwanted, and therefore there is only contact between the springs at the ends and at the centre where the axle is connected. Spacers prevent contact at other points. Aside from a weight saving, the main advantage of parabolic springs is their greater flexibility, which translates into vehicle ride quality that approaches that of coil springs. There is a trade-off in the form of reduced load carrying capability, however. The characteristic of parabolic springs is better riding comfort and not as “stiff” as conventional “multi-leaf springs”. It is widely used on buses for better comfort. A further development by the British GKN company and by Chevrolet with the Corvette among others, is the move to composite plastic leaf springs. Nevertheless, due to missing inter-leaf friction and internal dampening effects, this type of spring requires more powerful dampers or shock absorbers. Typically when used in automobile suspension the leaf both supports an axle and locates/ partially locates the axle. This can lead to handling issues (such as ‘axle tramp’), as the flexible nature of the spring makes precise control of the unsprung mass of the axle difficult. Some suspension designs use a Watts link (or a Panhard rod) and radius arms to locate the axle and do not have this drawback. Such designs can use softer springs, resulting in better ride. The various Austin-Healey 3000’s and Fiat 128‘s rear suspension are examples. 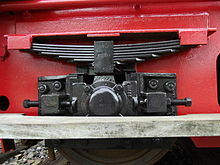 The leaf spring acts as a linkage for holding the axle in position and thus separate linkages are not necessary. It makes the construction of the suspension simple and strong. Because the positioning of the axle is carried out by the leaf springs, it is disadvantageous to use soft springs i.e. springs with low spring constant. Therefore, this type of suspension does not provide good riding comfort. The inter-leaf friction between the leaf springs affects the riding comfort. Acceleration and braking torque cause wind-up and vibration. Also wind-up causes rear-end squat and nose-diving. The inter-leaf friction damps the spring’s motion and reduces rebound, which until shock absorbers were widely adopted was a great advantage over helical springs. Because leaf springs are made of relatively high quality steel, they are a favorite material for blacksmiths. In countries such as India, Nepal, Bangladesh, the Philippines and Pakistan, where traditional blacksmiths still produce a large amount of the country’s tools, leaf springs from scrapped cars are frequently used to make knives, kukris, and other tools. They are also commonly used by amateur and hobbyist blacksmiths. The “diaphragm” common in automotive clutches is a type of leaf spring. Leaf Springs: Their Characteristics and Methods of Specification. Wilkesbarre, PA: Sheldon Axle Company. 1912. p. 1. “Kamis, Khukuri makers of Nepal”. Himalayan-imports.com. Retrieved 2011-11-06. “Joe Andon’s leap of faith”. The Australian. Retrieved 2013-07-04. “Trampolines WO 2012167300 A1”. Retrieved 2013-07-04.